This entry was posted on March 14, 2019 by Herb. DAYTONA BEACH, Fla. (March 14, 2019) – Briar Bauman (No. 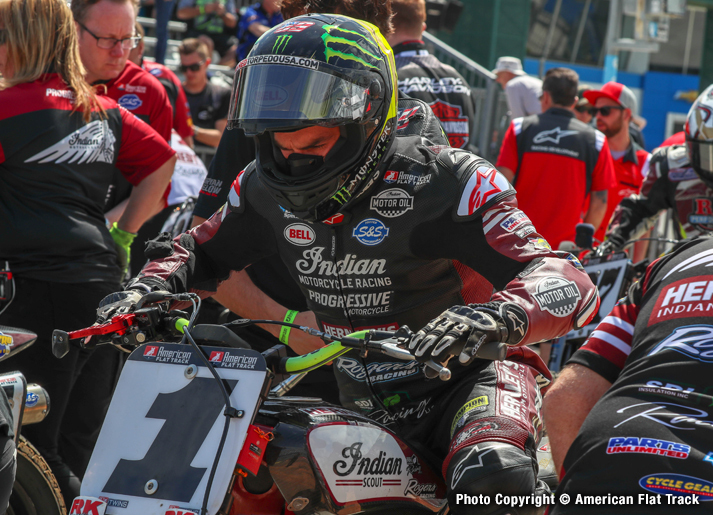 14 Indian Motorcycle/Progressive Insurance FTR750) kicked off his 2019 AFT Twins presented by Vance & Hines championship campaign in front of AFT's largest crowd at the Daytona International Speedway with a statement victory in Thursday night’s American Flat Track season opener, the third annual DAYTONA TT presented by Russ Brown Motorcycle Attorneys. Besides handing him the (very) early title advantage, Bauman’s triumph also brings the DAYTONA TT win streak of reigning Grand National Champion Jared Mees (No. 1 Indian Motorcycle/Progressive Insurance FTR750) to a halt at two. Those prior victories served as springboards for dominant title runs in '17 and '18, but Mees' 2019 opener packed at least a half-season's worth of drama into a single night. Mees crashed twice in the Semi and then retired with a fuel-related mechanical issue in the Main while running fifth.